We’re just west of the intersection at Prescott & Duckworth, on the north side. There are a set of stairs between two concrete walls with a mural of an applauding audience. The hall is at the top of the stairs. We have free parking for our patrons after 6 pm on weekdays, and on weekends. Located outside the Fortis Building at Habourfront and Prescott. 100 parking spaces are available First Come, First Serve. Located north of Duckworth, behind the Bluedrop Performance Building. 60 parking spaces are available First Come, First Serve. Any vehicles parked outside of these designated hours will be ticketed and/or towed and overnight parking is strictly prohibited. Also, please note that there is no parking available on Victoria Street. 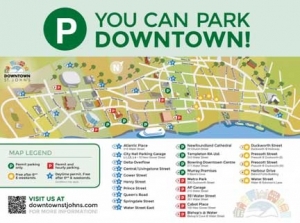 If you get downtown early enough, you can usually find street parking on Duckworth and after 6pm and at the weekends you do not have to pay meters. If you are just popping in to pick up tickets, you also might be able to find a parking space in front of the building in between the two LSPU Hall signs. Is there any special theatre etiquette I need to know? Not really—just the usual kind of thing. Like going to movies, we ask you to be nice to your neighbours and turn off your phones and electronic devices before the performance begins. Also, the use of cameras or recording devices is prohibited inside the theatre and the Cox & Palmer Second Space during performances. How early should I arrive at LSPU Hall? It’s best to arrive at least 30 minutes before the show starts. We also have a bar in the Cox & Palmer that is often open prior to the performance so you can have a beverage prior to the show. After a show begins, latecomers usually aren’t allowed in because it can be distracting to the actors and other patrons. Sometimes, specific productions allow latecomers, but it’s best to be safe and arrive on time or a few minutes early. Every show has a different latecomer policy that the renter decides on. Be sure to check your ticket or show description to see if latecomers will be allowed. We can’t promise that you’ll be allowed in until intermission. In general, all latecomers are permitted entry through the balcony door instead of the main door of the theatre. Evening performances usually begin 8 pm, Tuesdays through Sundays, with Sunday matinees starting at 2 pm. Still, be sure to check the start time for each show to make sure. How long is the show? And is there an intermission? The running time of each show is different, so it’s best to look up your show’s description. Do you offer wheelchair seating? Just call the box office to make sure you get the seats you need. A complimentary ticket will be provided if you have an attendant’s pass or will be bringing an attendant with you. The LSPU Hall is fully wheelchair-accessible. We have a front door ramp and a lift in our reception area to bring you up to the theatre. What’s more, all of our washrooms are wheelchair-accessible as well. Ticket prices are determined by each renter, so it’s a good idea to check the specific description of the show you’d like to see. 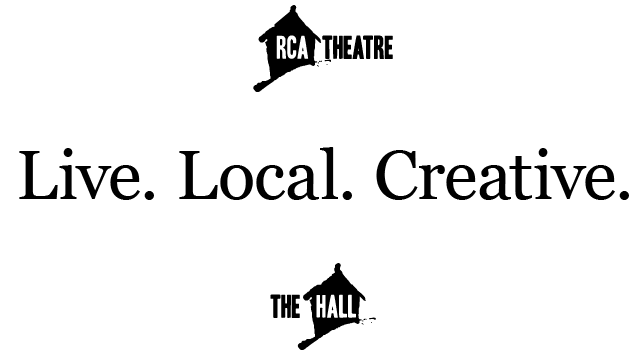 Sometimes RCA offers ½ price and/or Pay-What-You-Can tickets for matinees, but it is not always the case so it is best to check the specific performance description. How does Pay-What-You-Can (PWYC) work? Pay-What-You-Can performances are generally on Saturdays or Sundays at 2:00 pm. Just pay us what you can afford and you’ll get your ticket to your show. And if you really enjoyed your show, you can always top up your original payment. Just let our Box Office or Front of House staff know, and we’ll accept your increased donation. Please note that not all productions offer a PWYC option, so check the show description on our website to make sure you aren’t disappointed. Unfortunately, they’re not. Matinee prices are set by the production company putting on the show, not the RCA (LSPU Hall). So be sure to check the description of the show on the Events or Purchase Tickets page. You bet we do. Just head over to the Cox & Palmer Second Space on the main floor to check out the bar – we offer beer and wine options only. Our bar usually opens one hour before show time. We offer beer, wine, and soft drinks only. Just remember: Drinks are not allowed upstairs in the Main Stage Theatre, with the exception of bottle water. Can I buy tickets for a future performance while I’m purchasing tickets at the door for that night’s performance? There’s usually a huge lineup of patrons trying to purchase and /or pick up their tickets for that night’s performance, so it slows down our Box Office staff’s ability to get people upstairs on time for the show.